Launch : Drive south from Brandon on Highway #10. Turn east on Highway #2 a few kilometres past the Log Cabin. Take the Margaret road (#346) south. Access is on the north east bank. 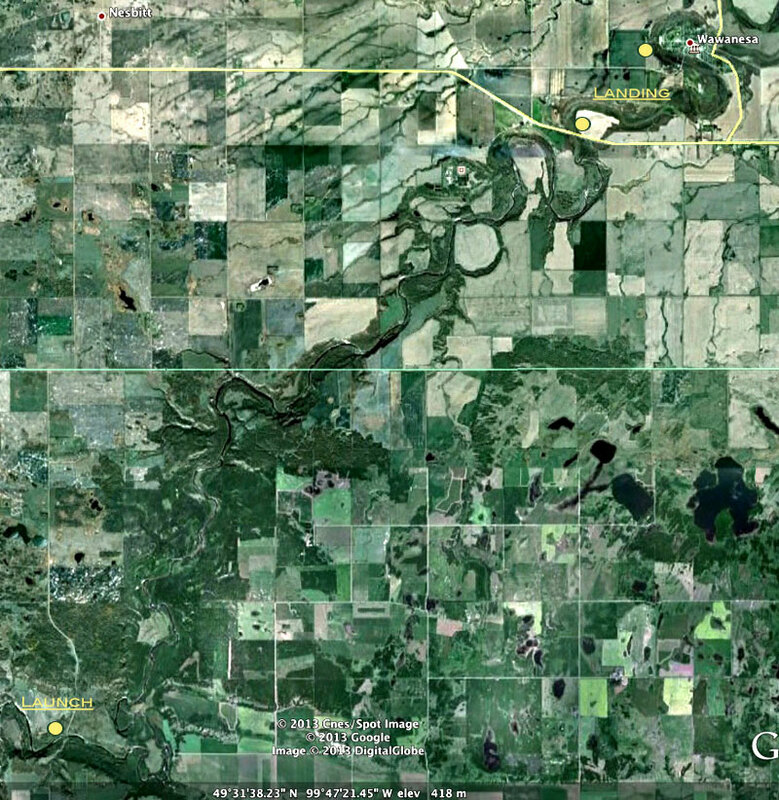 Landing : The destination drop is on the north side of Highway #2 near Wawanesa, just east of the bridge. When we did this stretch, in the early summer of 1996, it took 6 1/2 hours of steady paddling. The water was still high but not nearly so high as earlier in the spring. There are many rapids, all passable with caution if the water is high enough. This is by far the most interesting stretch of the Souris - rapids around every corner - just enough rocks to keep it interesting. The secret is doing this stretch at just the right time of year. 1998 proved to be an exception due to extremely high rainfall, we were able to do this stretch twice in early July. The first part of the journey seems to take the longest. The river changes in direction from south-east to north-east in a twisted series of meanders. After the first few hours it straightens out and you begin to make progress. The first rapids are just before Lang's Crossing. We stopped in a small channel on the left side to survey them. We were able to pick a spot between the rocks on the left side about 6 metres in - clear sailing if you start at the right spot. There are more like this to come. During the quiet stretches, enjoy the high cliffs, watch for wildlife (we saw a large group of eagles ), and listen for the next set of rapids. The river nearly reaches Highway 2 before doubling back, so if you find yourself turning almost south west, and you've noticed highway sounds, that's a sign that your getting close - another half hour or so. The spot just at the foot of the first rapids is Lang's Crossing, an important ford in the days before roads and bridges. Gregory's Mill served the area in the 1880's. The three story stone structure was abandoned after flood water washed the dam away two years in a row, and competing mills were established in surrounding towns. All that remains are some foundation stones and the overgrown mill race. Just past the mill site is a steep cliff that was used as a buffalo jump site. Early settlers found piles of buffalo bones which were later collected and sold for use in fertilizer production. Souris City was another "speculative city" which in 1882, according to the Free Press, had a gristmill, two stores, a hotel, blacksmith shop and school. 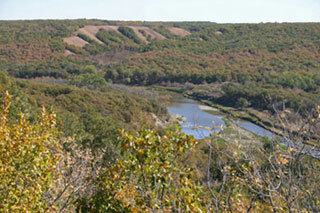 It was located on the last bend before the river heads towards the the bridge at Highway #2. (16-7-17). All that remains is a small cemetery. It is the site of what must surely be the shortest lived bridge ever erected in Canada. The structure, built in 1882, was 92 metres in length and cost $9000.00. The night before it was to be dedicated an ice packed flood ripped away part of it. It was repaired with a special centre spans that were removable during spring breakup, but the maintenance costs were high and the municipal council had it dismantled in 1889. (Ghost Towns) In that winter of 89/90 most of the buildings in Souris City were moved to the new site of Wawanesa as it was a more advantageous site for a rail crossing. An excellent retelling of the town's story exists in "The Prairie W.A.S.P (A History of the Rural Municipality of Oakland Manitoba) by J.A.D. Stuart.